Three season rooms can be a comfortable way to extend the outdoor season for Northern Virginia homeowners. 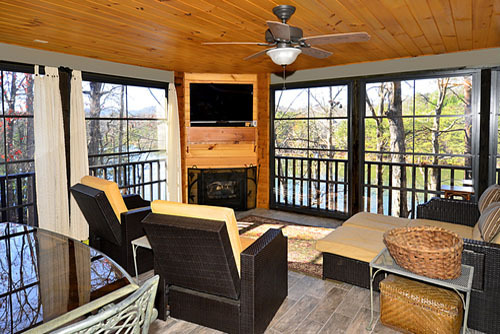 Enjoy the natural view and bask in the sunlight without leaving the comfort of your home with a three season room from Distinctive Deck Designs. Three season rooms are the perfect way to extend your outdoor season from spring to fall in the Northern Virginia area, allowing you to get the most out of your porch space even on the hottest summer days, in the dampest of spring showers, and on the chilliest fall evenings. With this home upgrade, there's no need to install heating or plumbing systems, insulate the walls, or excavate a foundation like there is with a year-round addition. A three season room is a cost-effective way to add on to your home and get more use out of the space all year long. 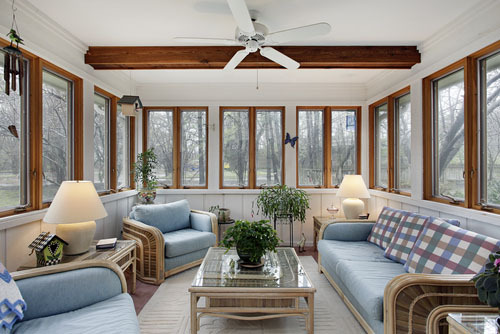 A three season room is an enclosed porch that can have either screened openings or windows or both. Also known as "sun porches" in Northern Virginia, three season rooms with glass window panels allow you to see the beautiful views while keeping the elements, allergens, and insects outdoors. It's more affordable to only have screens but it limits the ability to use this space during the colder months. While similar in purpose to a sunroom, the main difference is that three season rooms are built on to the home structure itself. Sunrooms, on the other hand, are generally interior rooms with many windows and require all of the same construction fundamentals as every other room in the home, such as insulation, heating and cooling, plumbing, etc. Most three season rooms are built off the kitchen, dining room or living room. This creates the perfect entertaining space for overflow during the holidays. Once it gets colder, homeowners can close this room off to the rest of the house without affecting their home's heating efficiency. It is possible, though, to add heated elements to this space for year-round use. Distinctive Deck Designs can work with you to include a gas or wood-burning fireplace to make this space all the more functional for you and your guests. Considering adding a three season room to your home? Check out our design guide. What is the Construction Process Like for a Three Season Room? Home renovations typically require a lot of work: from excavating the foundation and subfloor to installing electric lines, HVAC and plumbing, adding a new room to the home can be a costly, labor-intensive process. A three season room, on the other hand, does not need such extensive construction. This space conversion often uses the existing patio for the footing. It is initially built like a sun deck but with a roof on top of it. This makes this type of patio construction quick and budget-friendly. Am I Limited to Patio Roofing Styles? A three season room often uses three distinct types of roofing: gable, hip, and shed-style, which is a slanted type. Your patio contractor will tie your new roof in with the existing style to create a seamless look. If you have any special requests, such as a ceiling fan addition or skylights, be sure to discuss them with your contractor during the planning stages to plan the project accordingly. An enclosed patio space is a great investment for your home that pays off in more ways than one. Distinctive Deck Designs proudly builds three season rooms for homeowners in the three main counties near Fairfax. Request a free consultation with our patio contractors in Northern Virginia today to learn more!